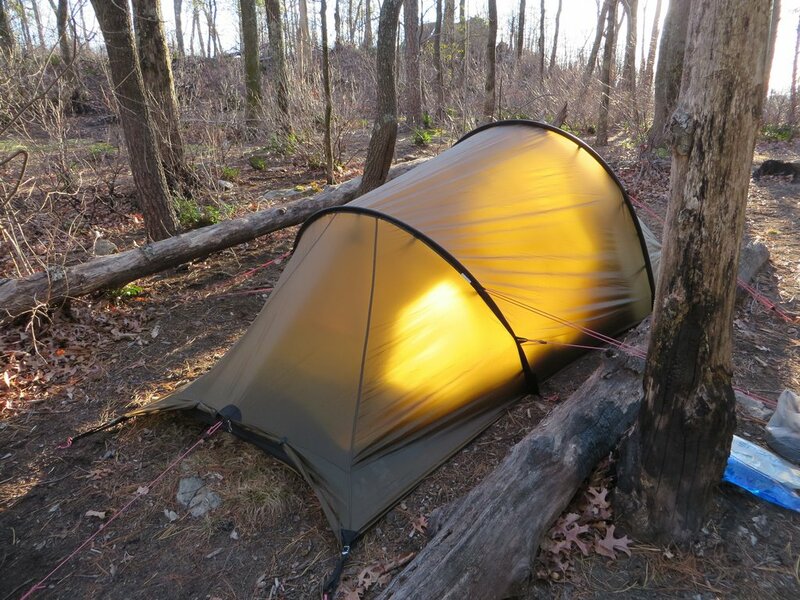 The Nallo 2 is the lightest all season tent produced by the Hilleberg, the tent maker. 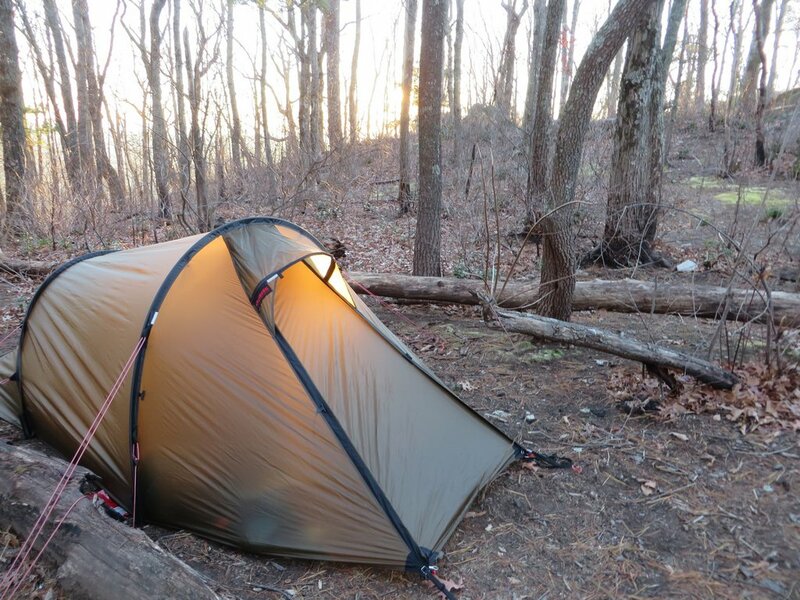 Hilleberg has a bit of reputation for building some of the best engineered tents on the market, but curiously absent here on the east coast. I wanted to put them to the test. Let’s see what I found. The Nallo 2 is a full, double walled hoop style tent. There is a large hoop strung through a fabric pole sleeve on the front, with a shorter pole for the foot of the tent. A large 46 inch long vestibule extends from the head, which doubles as gear storage and access to the tents interior. The inner and outer walls of the tent are connected for a dry pitch, but can also be detached and separated for a fly free pitch. It’s built from durable Kerlon 1200 nylon for the outer walls (rainfly), which is a double silicone material for added strength. The inner walls are a breathable nylon. The large vent up top is paired with a foot vent that can be zipped close to the ground, or opened up for a breeze tunnel style ventilation system. The tent weighs 5 lbs 1 oz packed, and has enough space for two people, retailing for $715. 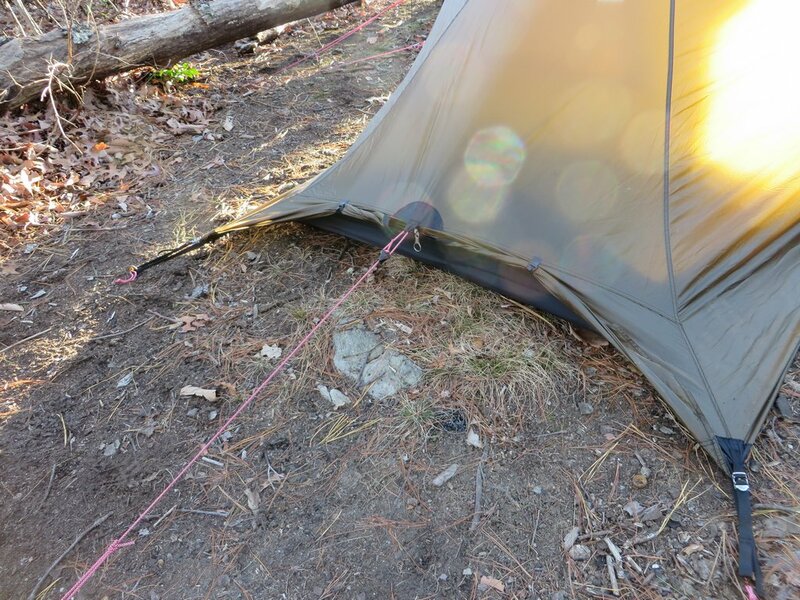 At just around 5 lbs, the Nallo 2 is one of the lightest true all weather tents on the market. It’s rare you can find real, reliable protection from the elements at such a light weight, but Hilleberg has made it happen with this one.Thanks to the tunnel design, durable poles, full sleeves and multiple guy out points, the Nallo can easily handle high winds. Despite the light weight, the build quality is exceptional. Durable Kerlon fabrics, quality stitch work, and burly sleeves and end caps for the poles come together to make an impressively durable tent. The included poles are thick, durable aluminum, and the included tent stakes are of equal quality. The guy lines are some of the thickest I’ve ever come across, and attach at multiple points along the pole sleeves to increase the tear strength. Full length pole sleeves increase the breaking strength and stability. The tension buckles are metal, and the caps that the poles slide into are thick, tough plastic to keep them in place and resist tearing. I have no trouble trusting this in the most brutal of storms. 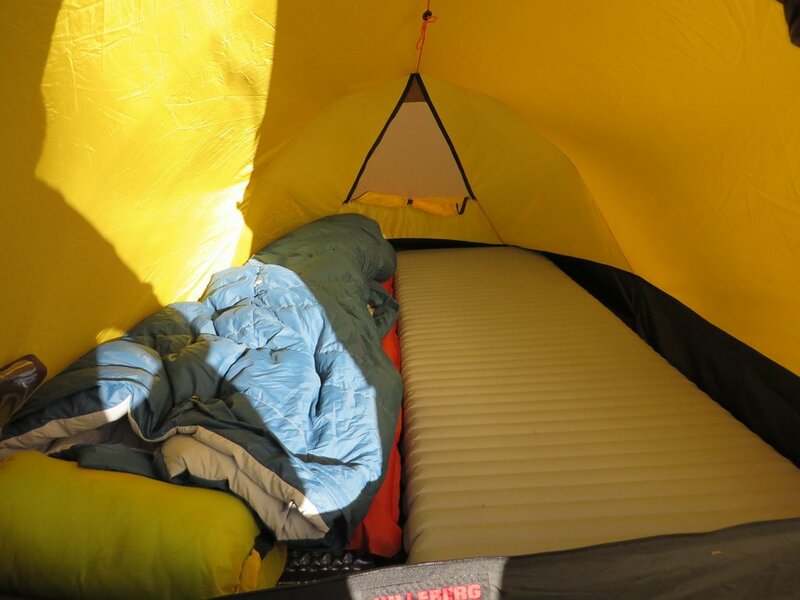 A full nylon interior does a great job of blocking wind and trapping a bit of body heat, but still allows for a good amount of air flow thanks to the massive air vent on the front, and a ventable foot box.The tent can be nearly completely closed up for added protection from the cold, wind, rain or snow. Gear storage is ample thanks to the large front vestibule. Two people can easily store all of their gear and still have room to get through without trampling all of their equipment. Having the inner and outer walls connected allows for pitching the tent dry when the weather if foul. This also allows you to use just in the inner tent on hot dry nights, or just the outer tent when you want more interior space. This is a great feature I wish more companies implemented. An internal tensioning line allows for users to adjust tautness after a storm has loosened up the tent fabrics without leaving the tent. Despite the massively roomy vestibule, the interior space of the Nallo 2 leaves much to be desired.With two people camping inside, there is little room to move around and get things done. Just sliding two average sized sleeping pads inside takes up pretty much the entire tent, and even pushed out the walls of the inner body a bit. Headroom and shoulder space is even more so problematic, practically making it impossible for two people to sit up and work at the same time. If you plan to do any more than hunker down to sleep, you’ll find the Nallo 2 a bit tight. The included gear pockets are small and limited in their use, essentially negating their own purpose. No attachment points are available inside to add addition pockets or lines, but the internal tensioner can be used to hold a limited amount of equipment. The Nallo proves to be a noisy tent when the wind kicks it around. The questionable choice of tiny Metal zipper pulls can jingle, and the Kerlon fabrics have a bit of a metallic sound to them when shaken or buffeted from the side. While not the noisiest tent I’ve ever slept in, the uniqueness of the sounds that emanate from the materials takes some getting used to. Mysteriously, there are no guy out points to stake out the long tube shaped side walls on the tent. This can give the tent some buffeting when the wind shifts and starts coming in from the side, adding to the noise. Having a large vestibule also results in having a long stretch to reach the zipper when trying to exit the tent. I found myself having to crawl across the ground just to access them. Once you do reach the zipper climbing in and out requires a hunched position, and generally isn’t very enjoyable. While setup is straight forward, having full pole sleeves feels antiquated, and makes for a slower setup due to having to shove poles through them.This is more difficult with cold hands, as you loose much of that dexterity and tactility that you need to slide them through the sleeves. Something about the tent has proven to create a bit of a capacitor effect, resulting is a high ability to store static electricity. This often causes the inner wall to attract and stick to the outer wall, and even attracts dirt and dust, making the tent difficult to keep clean. Perhaps this will dissipate over time, but so far it’s holding strong. Due to an unusual winter, like other tents we’ve been testing here on the East Coast, we’ve had no real snow to test snow loads on. I’ll update accordingly when we get a chance to dump some weight on the shelter. The Nallo 2 does a few things really well. It’s well built, very reliable, light weight, and is straight forward to setup. What it’s terrible at is being livable, quiet, and affordable. A few glaring issues like poor livability, and outdated setup system, and noisy nights really stand out when actually being inside the shelter. If your only concerns are durability and light weight, this is certainly a stellar option that I can’t recommend enough; however, if you’re looking for something to spend long dark nights in during the winter or rain storms,you could certainly get more for less. Thanks! 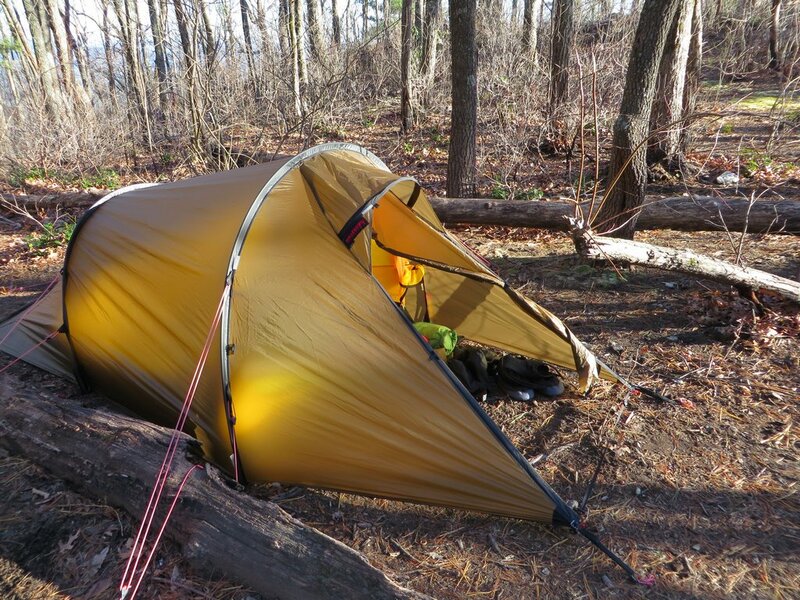 This review is a little older at this point, so there are more spacious tents for less weight now, but this one still holds up quite a bit better than most.